I’ve always been concerned on how my depression and anxiety will/would affect my daughter and there are lots of time when I have given myself a really hard time and have felt a failure and that I’ve let her down especially when her own overwhelming emotions showed themselves. When she was younger I always hid my depressive/anxious behaviour from her but now she is getting older I’m more open with her. We talk about how I am feeling and I reassure her nothing she has done has caused me to feel like this. Depression and anxiety gives you an inaccurate, unbalanced view of yourself and the world and it’s really hard when you are suffering from them to see things as they really are. It is also hard to deal with your own mental health and also support someone else with their own. Coming through a recent bout of depression I have spent time thinking about parenting and my mental health. What I have realised? It makes no difference whether or not you have a mental illness. I do the best I can. All parents need to take care of themselves and I am no different. Sometimes I need counselling and/or medication but this does not mean I am a failure. To me depression and anxiety is caused by nature not nurture; I can see that in my experience and in the behaviours of other people in my family (both now and in the past). I can’t change nature. Nurture is how we look after ourselves and how we teach and support others to look after themselves and find ways of living with depression and anxiety so it doesn’t take over our lives. My experiences of mental health have helped my daughter so I haven’t failed or let her down. Over past years science has made huge leaps in our understanding of the working of our brains. We now know how powerful the brain is, how it can change/be changed and that we need to work at training/helping it. As a culture we know how important physical health is and work at keeping healthy but we need to do more for our mental health. Society is starting to be more open and accepting of mental health. There is still a long way to go but what my daughter has experienced and has seen of my experiences means she is more accepting and open already at this young age. My daughter’s overwhelming emotions have given her skills and understanding in mental health and how her brain works that she would never had got otherwise. Hearing me talk about my mental health has shown her people can and do lead normal lives and she is aware people can look fine but underneath they are keeping a whole mountain of emotions under control and for some people it has taken an enormous amount of strength and courage for them to get out of bed this morning and into work. My daughter says she would like to be a children’s counsellor or a schoolteacher because she has experienced being a child with overwhelming emotions and wants to help them. She is still young and has plenty of time to change her mind but I know whatever she does she will be a caring, supportive person and anyone who has her in their lives will be very lucky. I have a fantastic, caring, compassionate, intelligent, funny, sensitive young lady as a daughter of whom I am so proud and that is due to her experiences (including overwhelming emotions) so far in her life. Whether we have a partner, family or friends we are not alone and we have other people to help. My husband is amazing and puts up with so much from me but he is still here and still loves me. His cheeky humour, level calm thoughts (not tinted by depression or anxiety) and his patience in reassuring me and making me see my depressive/anxious thoughts aren’t true help my parenting and also are a big part of the parenting of our daughter. I also have amazing friends and supportive family. How can I be a failure with support like that? I need to look after myself which means eating properly, not letting myself get tired, making sure I don’t do too much, exercising and doing things that I enjoy. I am too hard on myself and look at all the negative things I do. I need to stop and start being nice to myself and look at all the positive things I do as a parent. How can I be a failure with such a fab daughter and husband. This week I’ve felt loads better and more like myself 🙂 I’ve had fun trying out the fabric wax crayons I got in the summer; I was experimenting with an idea for Christmas cards. 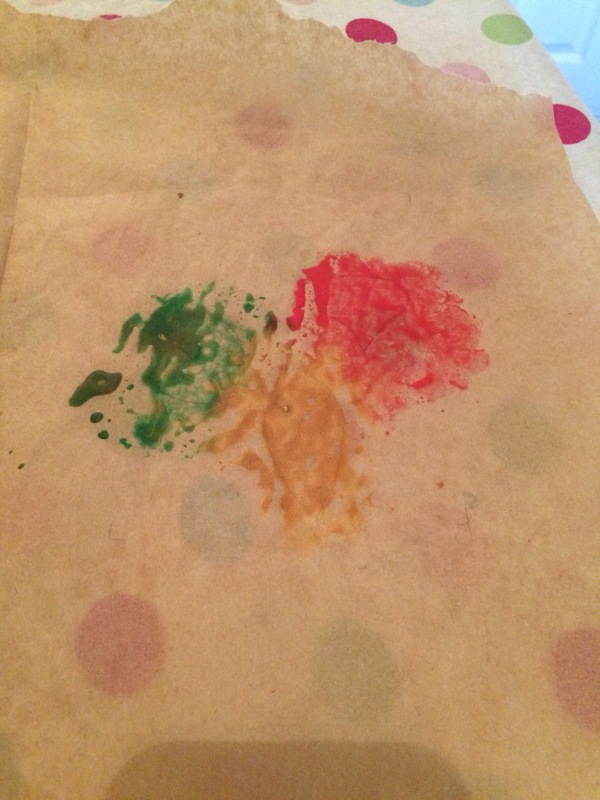 I took some scrapings off the crayons and put them on greaseproof paper. I folded the paper in half and then ironed on top of the greaseproof paper. 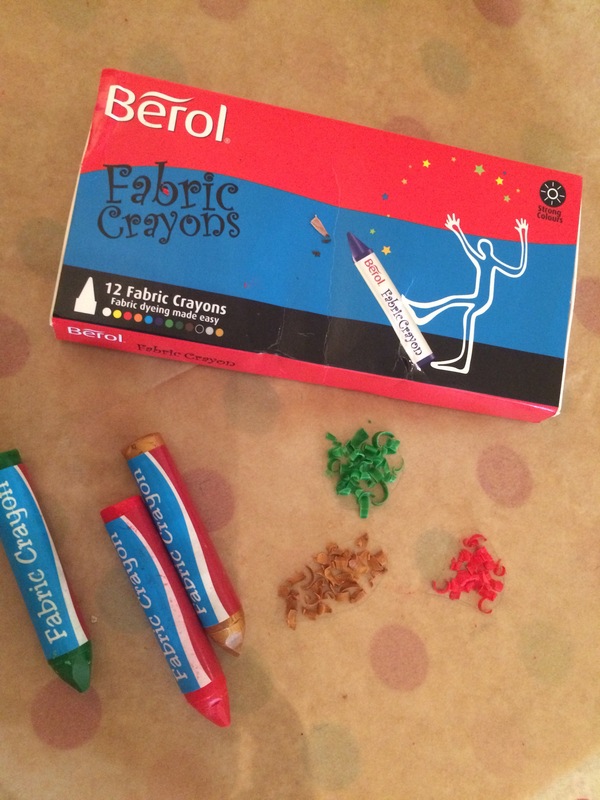 Once the crayon had melted the top layer was peeled off and the wax left to harden. 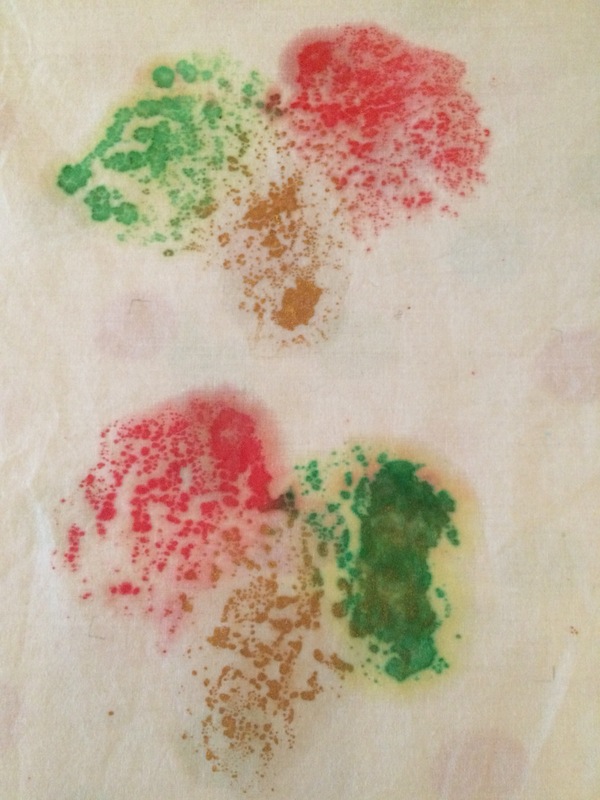 One of the pieces of the greaseproof paper was then turned upside down onto some fabric and ironed. 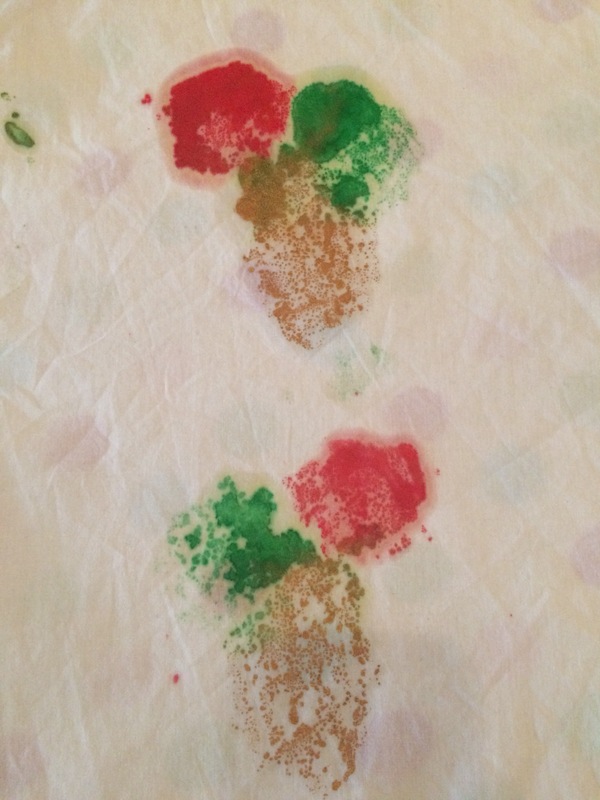 This transferred the wax crayons to the fabric. On my first attempt the wax was patchy. The second attempt was better but the gold wax crayon was still not great. Unfortunately I didn’t take any notice of the instructions to protect the ironing board cover and the wax crayon went through the fabric onto the cover!